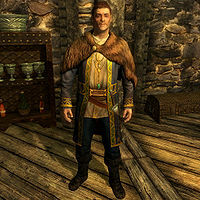 Saerlund, a Nord citizen, is the son of Jarl Laila Law-Giver and brother of Harrald. He lives in Mistveil Keep in Riften. In conversation he reveals that, despite his family being supporters of Ulfric Stormcloak, he despises Ulfric, and accuses him of being selfish in that he only wants power, and not freedom. Because of his dislike of Ulfric, his family think Saerlund is sick, to which end Laila asks her court wizard, Wylandriah, to diagnose and treat. To make matters worse, according to Saerlund, Laila and her family have shunned Saerlund to the point of denying him his inheritance as well as threatening him with disownment for his disloyalty. It would also seem that the staff of Mistveil Keep are against him as well, as staff members are often seen pushing him around. Now disowned by his family and incarcerated like a "common criminal", Saerlund spends most of his time sitting on a bench behind the jarl's throne. However, he does get a couple breaks from this sentence. He has breakfast at 8am, lunch at noon and dinner at 8pm, all meals lasting for two hours. He may be allowed to eat, but Saerlund never sleeps and can always be found sitting on the bench when he is not eating. Saerlund wears a set of fine clothes with a matching pair of boots. He wields a leveled dagger, which can be up to elven in quality, and carries a belted tunic along with a selection of upper-class loot and gold. Should you approach him, Saerlund will quickly think that you are going to ridicule him just like his family has: "Come to gloat, have we? To poke fun at the jarl's youngest son?" Similarly, he may also tell you, "I can feel you laughing behind my back." He may also think that Harrald sent you to pick on him: "Did Harrald send you to taunt me?" You can ask him why you would want to ridicule him, in which case he will then explain how he upset his family: "Because I did something not a soul in this bloodstained house of war has the backbone to do... dared to speak my mind. I dared speak of the Empire and the lies that have been spread by Ulfric, the leader of the Stormcloaks. Now my mother's stripped me of my heritage and incarcerated me here like a common criminal and my brother has all but disowned me." He will then close this short story by giving you some advice: "Be wary what you say around here, friend. You'll find not all take kindly to 'insurrection.'" You can also ask him to elaborate on what sort of lies Ulfric has been spreading, which will lead him to provide you with his opinion on the Stormcloak leader: "Ulfric only cares about one thing... Ulfric. He's ordained himself the future High King of Skyrim and steps on anyone that gets in his way. He's begun a rebellion against those that wish to eradicate the worship of Talos and uses it as his rallying cry. His cause may be true, but the man is a lie... all he holds in his heart his lust for the throne." Harrald: "I see you still have the run of the place, traitor." Saerlund: "The things you say are just an act to please mother." OR "Come now brother, don't act all high and mighty. I know you could care less about the war one way or another." Harrald: "Perhaps. Perhaps not." OR "I'm disappointed in you brother. You had it all. You had it all and your mouth cost you everything." Saerlund: "At least I've chosen a side instead of acting like a spectator." OR "One day, you'll be forced to make a choice. And I hope it's the right one, brother." Saerlund: "So, is this what it's come to? You'd have your own flesh and blood hanged just to solidify your grip as the next Jarl?" Harrald: "If that's what it will take then so be it." Saerlund: "You've changed, brother. And not for the better I'm afraid." OR "What's become of us? We used to be inseparable... always fighting back to back and letting nothing stand in our way." Harrald: "I've done what I needed to do keep mother happy. It doesn't matter what I really believe." Saerlund: "You've done what you've had to for yourself, not for mother." OR "Wise up, Harrald. There's a storm on the horizon and it will blow through here with all its fury. It's time to choose a side." He and Harrald will not leave after Imperial annexation of Riften; in addition, his dialogue will not change after Laila has been exiled. This page was last modified on 4 November 2013, at 14:25.